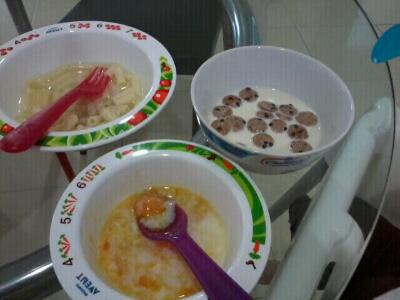 Made 3 types of food for Kz's breakfast last weekend as he was so picky and rejected the first food I offered to him. I cooked maceroni in corn soup for him initially as he used to love it and could finish a bowl in a jiffy previously. But upon putting 2 miserable pieces of maceroni into his mouth, he pushed away the bowl and mentioned "egg". Well, luckily I had stand-by 2 half-boiled eggs with a wee bit of soy sauce. Fed it to him and he loved it. He finished almost 1 egg. I then prepared some choco corn flakes with fresh milk and tried my luck as I felt 1 egg was not enough for him. 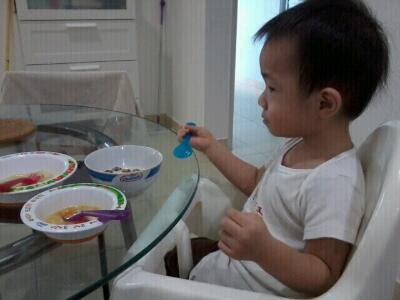 He ate too and finished half the bowl of corn flakes with milk. Oh, Kenzie boy, what a picky eater!